One of the objectives of ISPA Programme, Measure Cluj, co-funded by the European Union is making a sampling of raw water intakes in Lake Tarniţa adduction pipes and a length of 5 km downstream of the dam located Warm Somes. After completing the program Tarniţa will become the basic source of raw water system served by CASSA. All investments promoted by C.A.S.S.A. final aim water quality and services provided. These are not sufficient. The whole community should be involved in protecting water sources and avoid pollution areas where they are located. This activity, which has a continuous character, is necessary to protect community health potential risks that could result from pollution sources, environmental protection and preserve this precious resource for future generations so. In order to achieve this objective and the European Union as a condition attached ISPA funding was necessary to develop a POLLUTION PREVENTION PLAN BASIN TARNIŢA-GILĂU (PPP T-G). The main goal TG PPP is to achieve and maintain a good quality of all waters in the catchment Tarniţa – Gilău and ensure quality of raw water due to the EU and Romania for new water mains will be built Tarniţa under the measure ISPA Cluj. To achieve this goal, were co-opted all authorities, institutions and bodies which have explicit responsibilities in environmental protection, water, or which may contribute to this effect. Their representatives were divided into four working groups with distinct action plans specific to group work, but integrated into the PPP TG general. 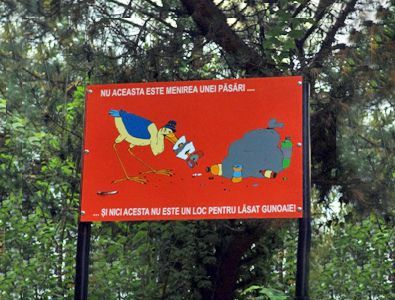 PPP Tarniţa – Gilău has a component that provides measures of media, information and awareness-education of the community, so that it is involved in civic spirit, in an effort to prevent pollution of the area in which the water sources of Cluj and protect them. C.A.S.S.A. adopted a logo for community awareness campaign on the need to protect water resources and prevent pollution zone Tarniţa – Gilău. This is Crane – Coco! 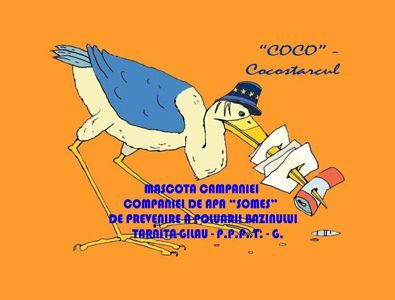 In your roads in this special tourist area which is Tarniţa basin – Gilău, you will encounter panels Coco logo. We will remind that clean water for a community of civilized means of ALL our contribution to pollution prevention and environmental protection. 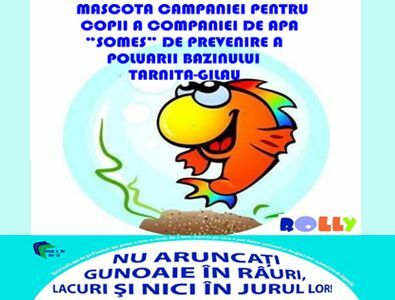 Pollution Prevention Awareness campaign Tarn-Gilău basin is aimed at children and ROLLY symbol – fish. 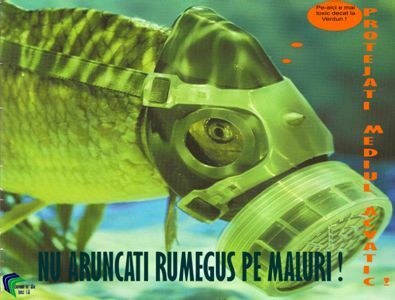 Awareness campaign to the target group of local residents in the watershed Tarn-Gilău to prohibit storage of sawdust on the river banks is symbol “carp with gas mask”. Tannin content sawdust is not only highly toxic to both creatures and plants in water, but also affects the quality of raw water. among other things, posting boards awareness against waste disposal recreational areas.